Buying a pool table light can be a complicated and confusing process, and unless you get the right size and hang it in the correct way you could risk some pretty inconvenient lighting problems. 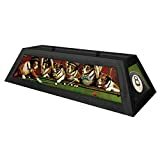 To help you find the best pool table light for your billiards room, below we have reviewed several of the most popular lights currently available, including a list of the pros and cons for each light. We have also put together a Pool Table Light Buying Guide, in which we will offer some advice on how to choose the perfect pool table light for your table and room. What Is the Purpose of the Pool Table Light? What Size Light Do I Need? The Iszy Billiards 72″ Pool Table Light is a fairly large and very efficient light designed for bigger pool tables. The light comes with four 15 inch metal shades that look brilliant when the light is glowing, and the shades are painted white on the inside as a way to reflect light onto the playing surface. Recommended for tables that are 9 feet in length, the UL listed light can either be hardwired or plugged in using a handy adaptor. The light comes complete with mounting hardware and instructions, as well as an adjustable chain for hanging the light at a perfect distance above the table. High-quality metal shades. The high-quality metal shades make the Iszy Billiards 72″ Pool Table Light look very modern. Even lighting. With this state-of-the-art pool light there is always even lighting without any shadows. Easy to install. 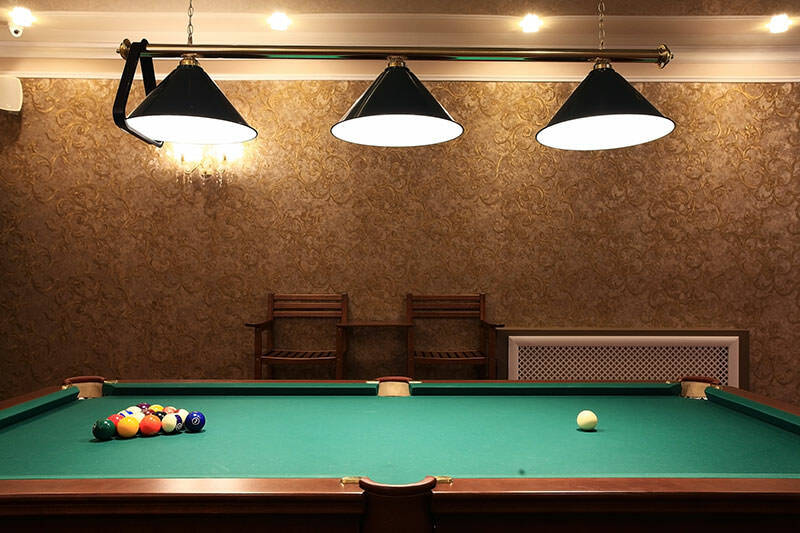 Whether hard-wired or plugged in, the Iszy Billiards 72″ Pool Table Light is easy to install. Adaptor not included. Those choosing to plug in their Iszy Billiards 72″ Pool Table Light will need to purchase an adaptor. No light bulbs. Light bulbs for this specialty light will have to be purchased separately. 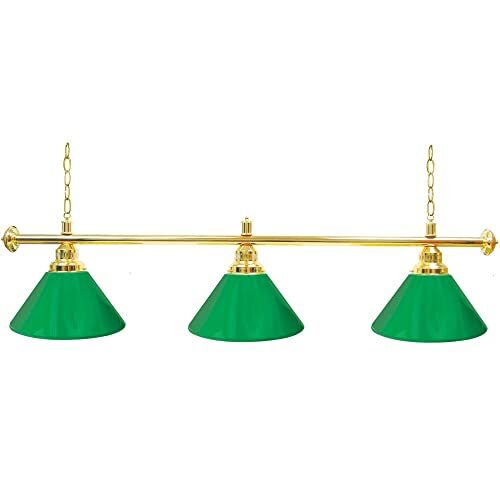 When it’s time for a new pool room light, you cannot beat the classic Trademark Gameroom Green Gameroom Lamp. With three shades, the lamp looks great in any game room and blends in effortlessly with any home décor. 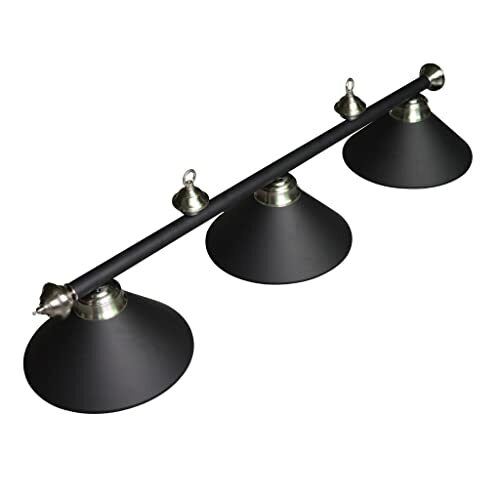 The package includes 3 independent bulb sockets hung gorgeously from a durable poly-resin shade. The kit comes with two fully adjustable chains for hanging the light above the pool table, which ensures even weight distribution and no rocking back and forth. The three shades on the Trademark Gameroom light are held in place by a brass support structure. You can use your preferred lighting bulbs once you install the lamp, but you will need a 110-volt power supply for it to work ideally. Attractive design. The attractive design on the Trademark Gameroom Green Gameroom Lamp makes it very aesthetically pleasing. Two chain hanging. The two easy-adjust chains on this three-shade lamp make hanging it a breeze. Ideal size. The pool light is ideally sized for most home pool tables. Power hog. The Trademark Gameroom Green Gameroom Lamp consumes much more power than other lights in this class. Plastic shades. The shades on the light are plastic and thus do not reflect the light very well. 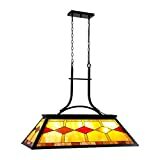 The 54-inch Hathaway BG2576 3-Shade Billiard Light is a great mid-sized light and is absolutely perfect for providing adequate lighting to every corner and crevice of a home-based pool table. The contemporary light comes in a black matte finish with sparkling chrome accents, giving it a very distinctive look. Pre-wired, users with just a little know-how will be able to hardwire this light in just a matter of minutes. It comes with a 4-foot wire and 8-foot adjustable chain for hanging, as well as a ceiling cover and all the hardware needed for its installation. Easy to Install. The pre-wired package and easy-to-follow instructions makes this pool light very easy to install. Contemporary look. With a black matte finish and chrome accents, the Hathaway BG2576 3-Shade Billiard Light has an almost executive look about it. Paintable shades. The outside portion of the shades can be painted whichever color you prefer to match your home décor. No light bulbs. The recommended 60-watt light bulbs do not come with this pool light. No switch. There is no on/off switch on the cord of the Hathaway BG2576 3-Shade Billiard Light. When you set out to purchase the perfect pool table light, there are many factors and questions to consider. To help you select just the right pool table light for your table and the room in which is it situated, below we have compiled a brief Buying Guide in which we will cover all of these considerations and answer some of the questions you may have. The sole purpose of a pool table light is to provide adequate lighting to the surface area of your pool table. Some people make the mistake of thinking a pool table light needs to light up the entire room or just the surrounding area. This is not true. A pool table light is designed to illuminate your pool table so you will never miss an important shot. And to achieve this, you have to have the proper light for your table, and the proper placement at the ideal height above the table. As you might have guessed, the size of the pool table light you purchase is predicated on the size and dimensions of your table. Of course, you could ignore these dimensions and simply hang any old light above the table, but then you might find that there are areas of your table that are covered by shadows are spots where it’s difficult to see. When buying a pool table light, we highly recommend that you follow the size recommendations in the following chart below. By following these simple lighting requirements you can ensure just the right amount of light to play any style of pool. Hanging your pool table light is by far the most technical part of the process—a process that many novices get wrong. The first thing to remember is the light MUST be centered on the table. This should not be just an approximation, but something you measure and stick to. As you are hanging your new pool light, you may hear things like “a little to the left; a little to the right,” but if that is what’s necessary to ensure the light is properly centered—so be it. Hanging the light in the exact middle of the table is paramount to proper light distribution. If you are off—to the left or right—it could result in unwelcome shadows or areas that don’t receive proper lighting, so take your time and make sure it is exactly centered. So what about the height of the light? This is also very important. If the pool light is too low, you can hit it with your pool cue and risk a VERY bright spot right in the middle of the table as well as dark corners. If you hang your pool light too high, you risk blinding everyone who tries to play. A good rule of thumb is to make sure your light is hung at a distance of at least 40 inches high off the surface of the table, but no more than 70 inches above the table. This, along with proper centering, will ensure a perfectly lighted table and many fun games for years to come. Contemporary pool table lights represent the newest trends in lighting. These lights differ from our next category—modern—as modern is more of set style and contemporary represents the “right now.” If you want a light that showcases some of the newest themes in the industry, then contemporary might be a great choice. Modern Styled Lights are perfect for those with modern-styled homes. These are not necessary the newest lights available (although they could be), but they do look great surrounded by modern furnishings. Tiffany styled pool lights are absolutely beautiful, but they also tend to be one of the more premium priced styles on the market today. These stained glass lights will bring an old world, antique charm to your pool room—one that will go great with antique furnishings and rustic walls. Single shade lights are just that—lights with a single shade. However, having only one shade does not mean there is but one long light. There can actually be many lights in this one-shade fixture, and there often are. When buying a beautiful single shade light, however, there are some concerns of which you should be aware. When you are hanging a single shade light, that light might require some extra support due to the weight and shape of it—support in the form of an extra stud or building a cross brace for the light. The reason for this is the uneven weight distribution from having only one chain or rod connecting the light to the ceiling. With multi-shade pool lights, you can have lights with 2, 3, 4, 5 or even 6 shades on it. These lights typically hang from a chain or rod, which is adjustable to the desired length. Multi-shade pool lights are still “one” fixture, but because they generally hang from more than a single chain or rod they typically have a more even weight distribution from their hanging point, with no single chain or rod being responsible for holding the entire fixture up.